Haena Beach Park, also known as Maniniholo, (pronounced Ma-nee-nee-ho-lo) is near the end of the road on Kauai's north shore. The five and a half acre grassy park/campground has restrooms, outdoor showers, picnic tables, and a large parking area. A couple of vender trucks selling fresh fruit smoothies and/or fried shrimp are usually in the parking lot. Across the road, opposite the park, is a tall, steep rock cliff covered in green foliage and vines. At the base of the cliff is Maniniholo Dry Cave; a large wide cave that goes back into the cliff a few hundred feet. Haena Beach is another must see beach on Kauai. It's wide, long, and beautiful and forms a shallow crescent that stretches out to a point on the right end. There is a life guard tower near the park. The beach here is not protected by a reef so the surf hitting the beach can get very big - especially in the winter (December - March). It is not recommended to go in the water during high surf ... leave this to the expert surfers that you'll see further out. Snorkeling at Haena Beach isn't good, as the bottom is sand and not particularly interesting to look at nor favorable as fish habitat. This beach is more interesting to enjoy from the sand. Sit back, relax and enjoy watching the waves. 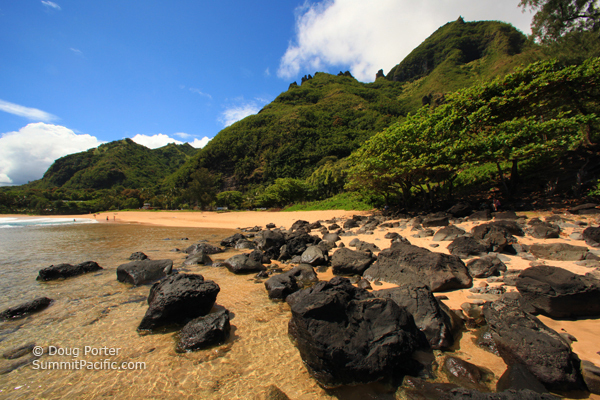 Tunnels Beach is just a ten or fifteen minute walk down the beach and around the point from Haena Beach Park. Snorkeling is much better there. Many people wanting to go to Tunnels choose to park at Haena Beach Park and walk back to Tunnels because the small parking area at Tunnels is hard to find and usually full anyway. Puka Shells can be found in the sand on Haena Beach. "Puka" is the Hawaiian word for hole and puka shells are small, round, pearly white shells with a hole in the center that can be strung into necklaces. It was here that the Puka shell necklace craze began in the 60s and 70s. Elizabeth Taylor is credited for starting this craze. Her brother is credited for starting "Taylor Camp" a famous hippie commune that was in the area in the early 70s until the State of Hawaii finally took action to remove them. Camping at Haena Beach Park is by permit and costs $3.00 a night. You'll see several tents set up on the east side of the park. Someone comes around just before dark to check permits and collect the fee if you don't have one. Maniniholo Dry Cave is just across the road from Haena Beach Park and is interesting to see while you are here. This cave is either a lava tube or it was possibly formed by ocean action before the beach existed. It's not hard to pull over and take a look, but it probably isn't worth going out of your way to see it - just my opinion. There is a similar cave or two further up the road with a pool of water in the bottom. Click for a list of the most beautiful Kauai Beaches. Vacation Rentals in Haena include Haena Beach House and Hale Kepuhi Vacation Home. More north shore vacation rentals are available in nearby Hanalei and Princeville.